Cards: Crown Royale 2013 Silver (#139/199), Crown Royale 2013 Red (#14/99), Panini Black 2013 (#019/399), Photo Memorabilia. An intriguing member of the Houston Texans, Ryan Griffin has shown flashes of promise in his limited playing time since he joined the Texans in 2013. 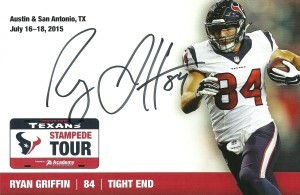 The Texans love drafting tight ends and Griffin found himself buried behind Owen Daniels and Garrett Graham. With Daniels going down after the 5th game, Griffin saw more active playing time behind Graham. When Griffin was out there, he provided a respectable option for the Texans’ ragged quarterback rotation. Viewed as a poor-man’s Daniels, Griffin logged 19 receptions (on 28 targets) for 244 yards, scoring his first professional TD against the Arizona Cardinals. As the Texans cleaned house after the 2013 season and new coach Bill O’Brien bringing in his multiple offensive system, Daniels was allowed to sign via free agency with the Ravens. Graham was elevated to starter and Griffin was relegated to third string again behind new arrival CJ Fiedorciwz. Still Griffin started 2 games and made 10 receptions. 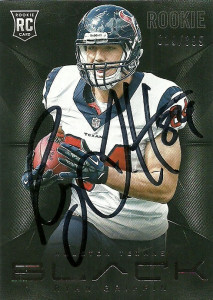 He scored his second professional TD in the Texans 45-21 blow out of the Tennessee Titans. While the selection of Griffin and Brandon Brooks met with a collective disappointed sigh from the autograph community- I relished it, because it ensured that the event would still be a draw for the true fans. 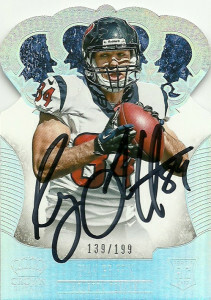 I quickly bought out what Ryan Griffin cards I could and prepared for the event the following month. 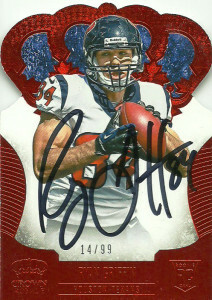 It was really difficult to locate cards of him that were not already autographed, or were of Ryan Griffin (QB Tulane). In the end I paid more for unautographed cards, but that’s just what a true type of collector I am. The players were really accommodating at the event. They signed a multiple for me and threw in the photographed memorabilia to boot. While Academy didn’t hand out numbers for the event beforehand, it wasn’t necessary. There were just not that many people there. Overall everything went well, and I was able to talk to some fellow fans as well while I waited. Both of these cards really hit the mark pretty well. I like the Crown Royale a lot- even if it is a bit over the top. The set in general integrates the crown icon and design very well into the player image. Overall, it’s a very nice presentation and as a bonus, the scans came out even better than the actual cards. The Panini Black is okay. Again I am just not a huge fan of blasting a card brand across the card, but still it is a solid image. Ryan has a pretty solid autograph. There are some nice loops in the name and its angular slant gives it an exciting feel.